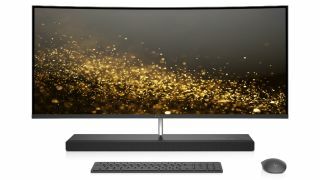 HP has revealed some goodies at CES in the form of a new all-in-one PC and a massive 35-inch monitor, both of which boast curved displays for greater immersion when it comes to watching movies or playing games. The HP Envy 34-b010 is an all-in-one PC which aims to provide a truly immersive home entertainment experience thanks to its curved display. To be precise, it’s an ultra-wide curved LED backlit display with a resolution of 3,440 x 1,440, and it benefits from tiny bezels which give it the appearance of ‘floating’ above the machine’s stand. And that stand sports an integrated sound bar with front-firing quad speakers (tuned by Bang & Olufsen) to help reinforce that immersive experience when you’re watching a movie on the Envy 34. Plus there’s built-in wireless charging for your Android smartphone via the stand, too. As for the core spec of the all-in-one, you get a quad-core Kaby Lake processor – the i7-7700T running at 2.9GHz – backed up with 16GB of system RAM, and an AMD Radeon RX 460 graphics card with 4GB of video RAM. Storage consists of a 256GB PCIe NVMe M.2 SSD alongside a 1TB traditional spinning disk of the 7200rpm variety. Connectivity includes a USB 3.1 Type-C port along with four USB 3.0 connectors, and there’s a “privacy camera” here as well, meaning it’s a pop-up affair which is only enabled when actually in use (so no more feeling paranoid and having to put a bit of tape across the camera lens). There’s also an infrared sensor to allow for secure logging into your system with Windows Hello. The price and launch date of the new HP Envy 34-b010 are still to be confirmed. HP is showing off further curves in the form of the Omen X 35 monitor, which boasts a huge 35-inch curved ultra-wide (21:9) screen with a resolution of 3,440 x 1,440. Just like the aforementioned all-in-one, the bezels are designed to be vanishingly small, again to give a more immersive experience along with the deep 1,800R curvature of the panel. The Omen offers a refresh rate of 100Hz and has Nvidia’s G-Sync tech on board to keep away any jitters or stuttering, and you get a nippy 4ms response time. HP has made the stand height adjustable for good ergonomics, and there’s also a handy integrated headphone hook, not to mention ambient lighting effects which can be customized to match the existing lighting schemes of your PC or gaming peripherals. It’s also worth noting that this is an anti-glare display, and in terms of connectivity you get a DisplayPort 1.2, an HDMI port (v1 .4) and three USB 3.0 ports. As with the Envy 34, pricing and launch details are still to be confirmed.